Addictions can be physical (of the body), psychological (of the mind), or both. In fact, almost any behavior can be termed an addiction if it becomes the primary focus of a person's life, and especially if it results in harmful effects to one's physical health and well-being. The term addiction is most commonly associated with a person's compulsive and habitual desire to consume a chemical substance, such as alcohol or other drugs. The addict's life is eventually dominated by the craving. It is estimated that up to 25 percent of the American population displays some form of addictive behavior. Alcohol. Alcohol is a central nervous system depressant that reduces inhibitions and anxiety. As the body becomes accustomed to a particular quantity of alcohol, more and more alcohol is needed to alter the drinker's mental state in the desired way. Eventually, the liver (an organ that plays a key role in digestion, filtration of the blood, and the storage of nutrients) can become damaged by constant exposure to alcohol and its metabolites (by-products of alcohol's breakdown). A damaged liver loses its ability to detoxify the blood, which can result in permanent mental changes, organ failure, and death. The opiates: opium, morphine, and heroin. Opiates (also called narcotics) are addictive drugs derived from opium, a drug made from poppy juice. They have a narcotic effect upon the body, meaning they dull the senses. In moderate doses, they relieve pain, promote a sense of well-being, and induce sleep; excessive doses, however, can cause coma or convulsions. Opiates include opium and its derivatives—morphine and heroin. Opium, a drug derived from the poppy, has been known since ancient times for its pain-relieving qualities and its ability to induce sleep. From the 1600s through the 1800s, it was widely used in Western medicine to treat a variety of ailments and was highly effective in deadening the sensation of pain during surgery. In China, addictive opium smoking was rampant by the late 1700s, where opium dens flourished. Some artists and writers of the nineteenth century claimed that opium use intensified their creativity by reducing their inhibitions. Opium is grown around the world, and in some countries smoking the drug continues to be common, though it is outlawed except for medicinal purposes in most Western nations. Preparations of opium, such as paregoric, are sometimes prescribed for diarrhea. Codeine, an opium derivative, is an ingredient in many pain-relieving medications and cough syrups. Detoxify: To remove poisonous substances from the body, generally performed by the liver and kidneys. Endorphins: A group of naturally occurring substances in the brain that act as analgesics, or pain relievers, and are released in response to emotional or physical stress; sometimes referred to as "internal morphine." Narcotic: A drug, such as an opiate, that dulls the senses, relieves pain, and causes sleep. Opiate: Any derivative of opium, for example, morphine or heroin. Withdrawal: The act of giving up the use of a drug by an addict, usually accompanied by unpleasant symptoms. Morphine is the active ingredient in opium. Discovered in 1805 by Friedrich Sertürner (1783–1841), a German pharmacist, it is the most effective naturally occurring compound used for the relief of pain in medicine and surgery. Its narcotic properties also produce a calming effect, protecting the body's system during traumatic shock. Once the hypodermic syringe (needle) was invented in 1853, the use of morphine injections for the relief of pain was adopted enthusiastically by the medical community. (Some doctors even taught their patients how inject themselves.) Morphine's popularity extended to America's Civil War battlefields, where the drug was used to treat wounded soldiers. Tragically, thousands of people worldwide became addicted to the drug. In 1898, the Bayer corporation (the maker of aspirin) synthesized (produced by chemical means) heroin from morphine and marketed it as a remedy for morphine addiction. Heroin, however, proved to be even more addictive than morphine. Used in a powder form that is dissolved in water and injected into the user's vein, heroin provides an immediate sensation of warmth and relaxation. Physical or mental pain is relieved, and the user enters a deeply relaxed state for a few hours. The powder also can be inhaled for a milder effect. Heroin is extremely habit-forming: with only a few doses the user is "hooked." Cocaine. Cocaine is a white, crystalline powder produced from the leaves of the coca plant, a South American shrub. It is extremely and powerfully addictive—some people need only a single exposure for addiction to occur. For centuries, South American Indians have chewed the coca leaves for their stimulating and exhilarating effect. Cocaine came into use as a local anesthetic in the late 1800s because of its numbing properties. As a pain reliever and stimulant, it was a common ingredient in popular nonprescription medicines of the late 1800s and early 1900s. By the end of the twentieth century, cocaine was used only occasionally in the medical field, sometimes as a local anesthetic for some kinds of surgery. Most cocaine now is purchased and used illegally. The white powder is often inhaled ("snorted"), sometimes injected, and as free base is smoked. A solid crystalline form known as crack, the most potent form of cocaine, is also smoked. Unlike the opiates, which cause drowsiness, cocaine gives its users energy. Caffeine. Caffeine is a stimulant found in coffee, tea, chocolate, and cola drinks. It has been part of the human diet for many centuries and is one of the most widely used central nervous system stimulants in the world. In recent years, researchers have raised questions about possible risks associated with high caffeine intake, but no definite conclusions have been reached about the harmfulness of moderate amounts. However, some experts consider drinking large amounts of coffee or cola beverages evidence of a true addiction to caffeine. Nicotine. Nicotine, the active ingredient in tobacco, is highly addictive, and cigarette smoking is among the most difficult habits for people to break. Many societies throughout the world have prized nicotine for its mood-altering properties: it is said to produce either relaxation or arousal, depending on the user's state. Addiction to nicotine results in more than 400,000 premature deaths each year from smoking-related illnesses such as emphysema and lung cancer. hallucinations, and seizures. Withdrawal from cigarettes can cause irritability and intense craving for nicotine. A coffee drinker may experience headaches and mood changes without the beverage. 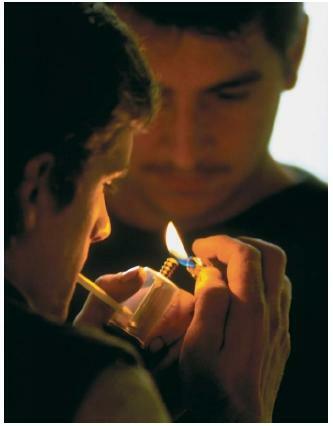 The hard drugs such as heroin and cocaine produce intense, sometimes violent, withdrawal symptoms. Abdominal pain, nausea, chills, tremors, sweating, hallucinations, and panic increase until eased by more of the same drug or treatment with medication to relieve the symptoms. Gambling. Compulsive gambling begins with placing small bets on horses or playing low-stakes card games or craps. As the gambler experiences the exhilaration of winning, he or she engages in bigger, more frequent, and more irrational betting. Gamblers place ever-larger bets to make up for their losses and have been known to lose their jobs, their homes, and their families as a result of their addiction. Work. Among addictions, no other is so willingly embraced than that of a workaholic, or a person addicted to work. On the surface, it might be difficult to tell if a person is a workaholic or just a hard and loyal worker. However, if work overshadows all other responsibilities in a worker's life, then the results can be telling. Focusing on work, workaholics tend to neglect their families, leaving the responsibility of raising their children solely to their spouses. All other social obligations are often neglected, as well. Finally, workaholics tend to neglect themselves, experiencing deteriorating health as they push themselves to the limit at work without regard for sleep or food. Counseling to identify the reason a person throws himself or herself into work is key for overcoming this addiction. Internet. The Internet connects people all over the globe, exposing them to new cultures and offering vast amounts of information. But when the computer world begins to rival the real world, it becomes an addiction. Internet addiction insulates people from intimate settings and relationships. Some people would rather commune with a computer than with their spouses and children. Many marriages, families, and even promising careers at work have been lost because an individual has become addicted to the Internet. Since this is such a relatively new disorder, few self-help groups exist. Strangely enough, there are some on-line support groups designed to wean people from the Internet. Others. Other compulsions or addictions include exercise, especially running. Running long distances triggers the release of morphinelike substances in the brain called endorphins, producing a feeling of euphoria or happiness. This is the "high" that runners often describe. The high feels so good that the compulsive runner may engage in his hobby despite bad weather, injury, or social and family obligations. Excessive weight loss can also occur as a result of compulsive exercise. The single characteristic common among all addicts—whether their addiction is chemical or nonchemical—is low self-esteem. Some experts believe that certain people are born with the predisposition (tendency) to become addicted to drugs or alcohol, particularly if one or both of the biological parents was a substance abuser. Social and psychological factors also may lead an individual to addiction. A desire to fit in, an attempt to relieve anxiety, an inability to cope with the stresses of daily life—all of these factors have been cited as possible springboards to addiction. Treatment of chemical addiction includes medical care of symptoms related to substance abuse and enrollment in a drug or alcohol rehabilitation program. In addition, participation in a self-help group such as Narcotics Anonymous or Alcoholics Anonymous can provide the emotional support an addict needs to stay away from drugs or alcohol. Psychological counseling and self-help groups can also be effective in treating nonchemical addictions. It is often difficult to break the psychological and physical grip of addiction. Success depends upon the willingness of the addict to admit that a problem exists—and possession of the strength and determination to overcome it. Many former addicts have enough resolve to avoid drugs and alcohol for the rest of their lives, but studies show an equal number will take up the habit again. This to me is a very interesting topic, due to the fact I was and Alcoholic for may years, and as well different other Drugs.. Please send my more info on this topic ! !